In Health Policy, students will learn how governments and institutions develop and implement policies that shape the health of Canadians as well as their health care system. These policies concern the organization of the health care system as well as the distribution of economic and social resources amongst Canadians that promote health and cause illness. Health Policy studies involves ideas and concepts from politics, sociology, political science, law and ethics.Students graduate from the program with the knowledge and skills that prepare them for careers as policy advisors, analysts, coordinators and researchers at all levels of government and the health system. 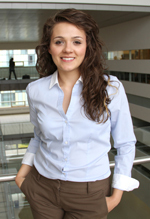 Julia works as the Divisional Coordinator for Peel Public Health’s Chronic Disease and Injury Prevention (CDIP) unit. The Region of Peel is the second largest municipality in Ontario, with a population of 1.3 million residents in the Cities of Brampton and Mississauga and the Town of Caledon. As a part of the management team, Julia delivers on objectives related to the Division’s day-to-day business, projects, planning activities and its Strategic Initiatives (i.e. Supportive Environments for Healthy Living, Tobacco Control, Oral Health, School Health etc.). On a day-to-day basis Julia uses the theories taught in her undergraduate courses, specifically the wide array of legislative and regulatory interventions, administrative practices and financing and funding models learned throughout her time at York University. She is currently working closely with the Director of CDIP on developing and implementing the unit’s strategic vision and business plan.